There is currently a national divide over the Affordable Care Act and it’s beginning to affect some Americans’ access to medical care and their ability to pay their medical bills, which is in complete opposition of what the law set out to accomplish. According to a Commonwealth study, residents of Florida and Texas have resisted expanding insurance coverage through the Affordable Care Act. The law is intended to fill in historical gaps in Medicaid eligibility for adults, and was envisioned as the means to extend insurance coverage to low-income individuals, with premium tax credits. In this scenario, the Marketplace coverage serves as the vehicle for covering people with moderate incomes. Conversely, what is happening is that Florida and Texas are not opting in and are reporting more problems getting adequate care than residents of California and New York, which states both guarantee coverage to their residents. The recent study looked at four of the largest states - two that expanded and two that did not - and compared resident's access to coverage and care. The results are significant. Let's take a look at what the Commonwealth study found. Commonwealth Fund, a New York foundation that studies health systems domestically and around the world, found that Floridians and Texans were also significantly more likely to struggle with medicals bills and to report that they had medical debt. "Health policy decisions made by state leaders matter," the study's authors conclude, warning: "Coverage gaps are leaving millions uninsured and without access to affordable coverage." The new research reiterates that the 2010 Affordable Care Act health law may be widening geographic health disparities in the U.S., which is driven largely by state decisions regarding whether or not to open their government Medicaid programs to low-income adults. 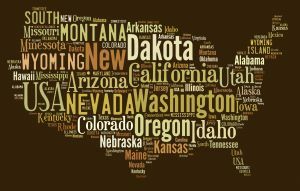 States that have implemented the law to the fullest saw a 4.8 percentage-point improvement in the share of adults with insurance from 2013 to 2014, according to a recent Gallup poll. That was nearly twice the rate of states that have not fully implemented. The poll also discovered that increases in coverage also are improving healthcare access. Because of the high resistance to the Affordable Care Act, Texans and Floridians have proved to have the highest rates of uninsureds in the country. The study determined that more than 40 percent of residents of the two states did not go to the doctor when they were sick, didn’t fill prescriptions, didn’t see a specialist or skipped a recommended test or treatment in the previous year. This same group reported they were unable to pay medical bills, had their balances turned over to collection agencies, and felt forced to change their lifestyle and the way they spent their money in order to pay their medical debts. By contrast, only 31 percent of Californians and 30 percent of New Yorkers reported the same access problems. Even fewer said they had the same struggles with medical bills. What Accounts for the Disparities? Researchers noted that insurance policies in Florida and Texas tend to have higher cost-sharing requirements, as one example, which probably adds to consumers’ billing challenges in those states. Insured people in California and New York were half as likely as insured Texans and Floridians to report having health plans with deductibles that were at least 5 percent of their income. 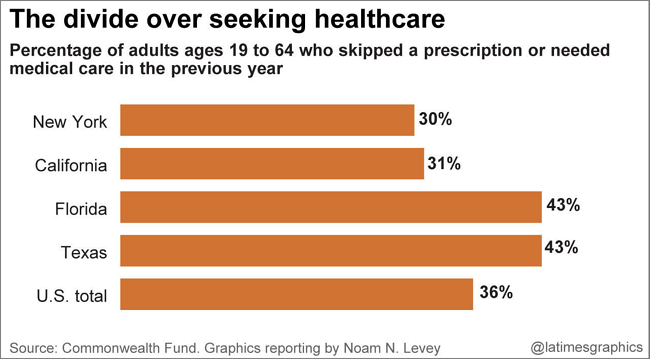 People with higher deductibles were more likely to report not getting needed medical care. The vast differences in insurance coverage between the states most likely explains much of the disparities in access. According to the study, 30 percent of working aged Texans and 21 percent of working aged Floridians were uninsured in 2014. By contrast, 17 percent of working aged Californians and 12 percent of working aged New Yorkers were without coverage last year. Some may estimate it is evident that increasing coverage improves people’s ability to get access to medical coverage. What are your thoughts on the differences in compliance from state to state? Share your thoughts with us.